Last week, HitFix television critic Alan Sepinwall published a very interesting article about the rise of serialization in television and how it is hurting the ability of many shows to construct coherently structured, compelling individual episodes. It’s a trend I’ve noticed recently as well, mostly because every week this space allows me to analyze iZombie, which is doing the exact opposite, and doing it well. There is an art to constructing serialized television that develops over many episodes, and there is also an art to constructing television episodes that are satisfying stories in and of themselves. iZombie just happens to be doing both things at the exact same time better than pretty much any other show on television. “The Hurt Stalker” is a flat-out great episode of iZombie, and this is because it falls within that sweet spot of advancing the show’s season-long arcs and presenting an engaging, closed-ended story of its own. “Procedural” has become somewhat of a dirty word for certain corners of the television viewership, but it’s precisely because of iZombie’s procedural elements that it can construct such a satisfying hour of television. The case of the week format can be a drag when you just want the show you’re watching to get to the “good” stuff—like the big, juicy arcs—but when it’s used as wonderfully as it is here, the procedural story becomes a bonus; something to build the episode around that gives it recognizable bones and a guaranteed payoff. It helps that this episode’s case of the week revolves around one of the main characters, and therefore guarantees more audience investment. It helps even more that this character is Clive, the one main character who the audience (and the other characters within the world of the show) knows the least about, and therefore are most receptive to learning new information. When one of Clive’s exes turns up murdered with Clive’s gun as the murder weapon, it not only creates immediate investment in figuring out the actual killer, but also turns the whole structure of the normal case of the week on its head because Clive can’t be the one investigating it. Instead, it’s Liv and Ravi taking over investigative duties in their attempt to clear their friend’s name. If there’s one small fault with the story, it’s that it never really feels like Clive is in much danger of taking the fall for the crime, but that’s a small quibble. Because the point of this case was less to make Clive’s job feel like it is in jeopardy and more to let Liv and Ravi (and in turn, the audience) learn a whole lot more about one Detective Clive Babineaux. Everything about the facts we learn are delightful. He plays the piano! He cooks Cajun food and brings it to Ravi and Liv, while lying and saying it comes from a restaurant! He loves Game of Thrones! Clive is so very often the straight man who’s just there to move the case of the week along, and it’s nice to get some human shading to him, and especially to see how much Liv and Ravi rally around him when he’s in trouble. They’ve been a de facto crime fighting unit, but seeing that unit graduate into a real friendship bond is fun to see. As for the case itself, the mechanics of it are solid, the red herrings feel like they have actual potential and aren’t just time killers, and the confession scene was surprisingly stark and emotional. The biggest advantage of it, though, was the victim’s brain. Having the victim be a bit of a mentally imbalanced stalker could have been rife with horrible clichés and offensive moments, but taking that jealousy and paranoia and using it to test Liv and Major’s relationship instead is extremely smart. This brain is exactly what Major has been wary of since getting back together with Liv, and the ways it affects both Major and Liv throughout are heartbreaking and emotionally compelling. It also gets at something the show has needed to explore for a while: How much can Liv fight the effects of the brains she eats? She promises Major she’ll fight what the brain makes her think, but she still goes through his texts, and stalks his Facebook page, and tries to open his safe. How much of this is her not being able to fight the brain, and how much of this is her being genuinely concerned that Major just can’t love her as much now that she’s a zombie? There are layers upon layers of things happening in these scenes, with Liv promising Major she’ll fight the brains and trust him, all while he’s still keeping huge secrets from her even though he’s asking her to be honest. They are both trying so hard to build this new thing with each other and make it work, but every time they try there’s a new wrecking ball coming at them and threatening to knock it down. What makes it even more dangerous—and more intense—is that Liv now knows about Rita, and is now posing as Major and texting with Rita, and she’s just a few keystrokes from easily finding out the truth. This is a show that is best when its stories slowly start collapsing on each other, and it feels like the top of the walls are beginning to crumble. The best thing about the stories on iZombie is that it never feels like there is a wasted moment, and this episode is a perfect example of that. 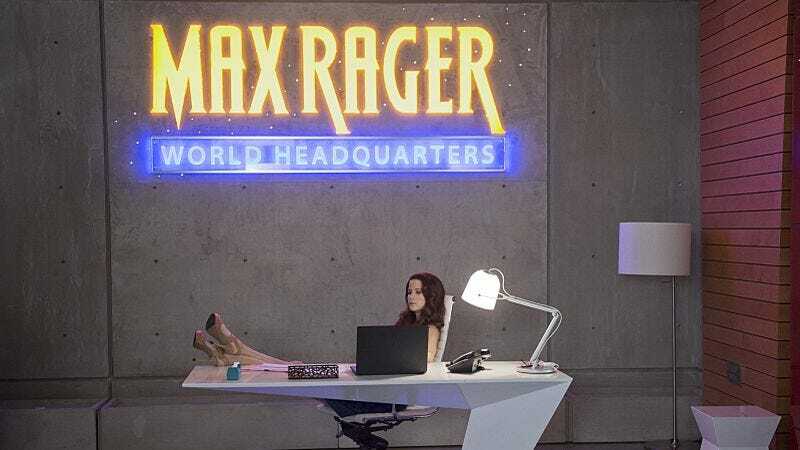 The case of the week is a satisfying mystery on its own, but it also serves as a conduit for Clive’s character development, and a way to tell a story about Major and Liv’s relationship, which then allows the season-long arc with Major and Max Rager to tie in and get some development, while also bringing Liv that much closer to learning about her roommate’s secret identity. I don’t know what the story board in the iZombie writers’ room looks like, but the way these pieces fit both within the episode itself and within the realm of the overall season is masterful work. That the episode was hysterical as well, that almost turns it into an embarrassment of riches. Rose McIver and Robert Buckley were both great in their scenes together in this episode. McIver was especially wonderful in the final scene. I’m not sure anyone has ever put as much emotion into a scene where their scene partner was an iPhone. The whole testing Super Max on zombies before giving it to humans is very confusing to me. Or are they testing it on both? Either way, Du Clark’s angry reaction after ingesting the stuff proves they have a lot of work to do—or another zombie outbreak is in danger of coming if they release it. “Karma Chameleon” playing on the radio when the Karma Cleaner guy gets busted? 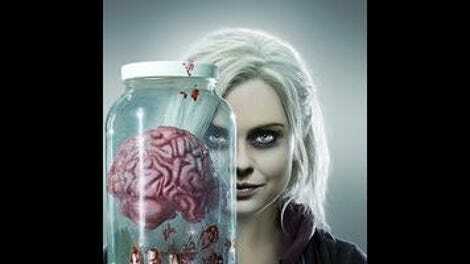 iZombie, you spoil us. I’m Only Happy When It’s Brains is officially my favorite comic panel title yet.